Allyship isn't always a walk in the park. Have you ever wanted to be an ally to someone or to a group but feared infringing on or taking up space in that particular marginalized community? How do you find the balance between getting involved and being potentially reduced to a more vulnerable role within an affinity group? Take a listen to the final episode of Diversonomics season 3. 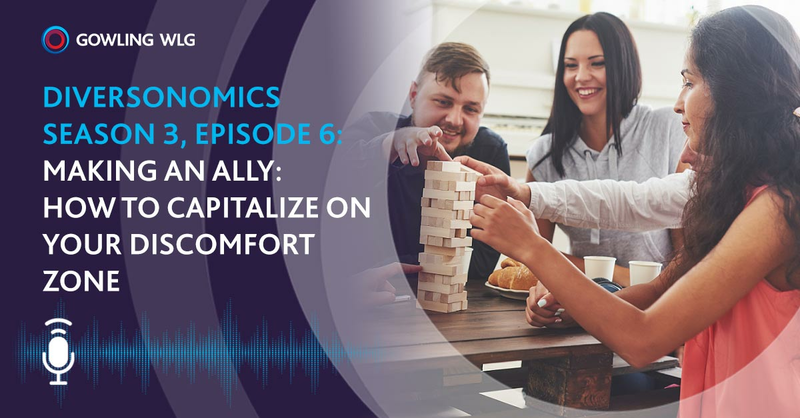 Our host Roberto Aburto sits down with Gowling WLG associate lawyer and future co-host of Diversonomics season 4, Cindy Kou, to discuss the meaning and challenges of allyship, lobbying for Charter rights, and why open conversations surrounding allyship are crucial. Roberto: This is a final episode for Season 3 of Diversonomics, the podcast about diversity and inclusion from Gowling WLG. I'm your co-host, Roberto, and we're finishing off this season with someone you're going to hear a lot from in Season 4. She practices law in our Toronto office, was one of the key leaders when Gowling WLG launched its diversity and inclusion council. She writes regularly and speaks on unconscious bias and will be our new co-host in Season 4. Welcome to the show, Cindy Kou. Cindy: Thanks Roberto. I'm really happy to be here. Roberto: Yeah, Cindy, so tell us a little bit about yourself. Why are you interested in diversity and inclusion? Cindy: Okay. Well, a bit about myself. So, I practice in the Toronto office, as you say, I grew up in Vancouver. My family moved to Vancouver when I was really small and I lived in Vancouver until I moved to Montreal for school. All through my years when I lived I Vancouver I just felt very included in my community. I never really felt very different. I grew up in a very vibrant community. Lots of people, some immigrant families, like myself. It wasn't really until law school that I started feeling like maybe this path was not the norm for a lot of people. Maybe because I was having some new experiences in law school and that's really what triggered my interest in, at the time I called it identity politics, and trying to figure out how I interacted with the world, how I wanted the world to interact with me. That's really where I think my interest in diversity and inclusion, as a focus, came about. Now I feel super lucky to be working for an international law firm and having the chance to participate in an initiative as strong as the one at Gowling WLG so we can further this conversation with great conversations like this one. Roberto: We certainly have a long way to go still but we are, I think hopefully, heading in the right direction. Cindy: I love it. Just even the fact that we have the space to talk about some of the issues that we are talking about to questions, within limits of our own knowledge, within the work space. I think that's amazing. Roberto: Yeah. One of the things that's come to the forefront of how to succeed in D&I is the importance of allyship. Do you agree with that? Roberto: What is that? What do you consider allyship to be? Cindy: I think allyship is taking the time and effort and resources to learn about the needs of somebody else. Some needs that may not be similar to your own and to use your voice and your space and your resources to speak up for that friend, or other group, that you've taken the time to learn more about and to help and support them succeed in the way they find meaningful. Roberto: From a practical sense, how does one become involved as an ally? Cindy: I think that's a great question and that it differs from context to context. I think the first part is maybe just having an open mind. Having an open mind to accepting that you may not know what the needs and experiences are of others. Especially if it's a background or a topic that you have had very little exposure to, growing up, then that might be a really good, if it makes you a bit uncomfortable, maybe that's a really good invitation to sit down and see what resources are out there to get some background on why you're feeling very uncomfortable or reading up about whatever the background is of the friend or colleague or news events that gives you a little a bit of thought. Yeah. I think that's the first step. Then from there, I think, getting involved, asking questions, this is a complicated question. Cindy: It's a super complicated question. Because I am also mindful of the importance of being curious and reaching out to some of my colleagues as well as not pigeonholing friends or colleagues or people you meet on the street. And asking them, "Can you tell me about", whatever feature it is about their life you find particularly find interesting. I think it starts keeping an open mind. From there just navigating where it takes you in life. Maybe I can give an example of a really powerful form of allyship that I've seen here in the office. As you know, there is, on an annual basis, we observe, the firm, Day of Pink and also in each office when there are Pride events going on in the city we also like to bring in speakers or have an event in your office, that's a bit more accessible to our colleagues. So one year we had a representative from Pflag come in from Pflag Toronto, come in and give a talk. For those that don't know, Pflag is where parents, family and friends of lesbians and gays. It's an organization that really, I think, started from family members, maybe parents, family friends, of people who have come out to them. It started, I think, as a support group for people to talk about how to support those members of their family. Or how to process some information that was very new to them. The speaker that we had come in was one of the vice-presidents of the organization and her son had come out to her. She said lots of people had poor support and she had gone with the organization and now amongst the other work she does for Pflag she does talks, like the one she did at our firm. What I thought was really amazing, and we kind of stumbled onto this by accident, was that she came and spoke about a topic, came and spoke about how to embrace and include the LGBTQ community, from the perspective of an ally. Up until that point we had, rarely had speakers from a particular affinity come and speak about themselves, as opposed to coming and speaking about an ally. The energy in the room that day was really different. It took me a long time to realize, to make the connection, between the engagement in the audience, and the amazing speaker of course, but the engagement in the audience and the fact that most people could identify as allies. As opposed to when we had somebody from an affinity group, maybe most people in the room could identify friends or family or colleagues, that we thought maybe fit into that affinity group, but did not have that same energy or emotional connection as identifying with that individual with that affinity themselves. It was really amazing the nature of the questions that came out. Very honest, open questions in the Q&A that followed and you could really see a lot of people trying to be there for the families and friends in their lives. Really happy to know that there are resources out there. I think that allyship can be so amazing to help other people along their path being better allies. Was that helpful as an example? Roberto: Yeah. I think so. It's interesting. I know when we started doing National Lunch & Learns, the very first year for International Women's Day we had a speaker come in, and the attendees were overwhelmingly female. Like 95%. At least here in the Ottawa office. I know that as we did it the next time, and branded it a little bit more around allyship, I think a lot of that same group showed up and also I think more people felt comfortable coming, that were male as well. The branding part in terms of trying to get the conversation going, it's about creating a safe space, a place where people feel welcome and ready to engage in the discussions. I worry a little bit too sometimes. I want to be an ally but I also don't want to intrude on space. A partner here had an excellent event on celebrating Arab Women in business and I reached out to her saying, "Am I invited. Can I come?" and she said, "Of course." but I did have that sort of hesitation to make sure that I was into the right space. It certainly was a great room and a really wonderful event. I'm certainly glad I didn't miss it. Cindy: I'm sure that the partner who reached out to you was really grateful that you were mindful enough to take that step. Because I think not everybody would or not everybody would take the time being in that uncomfortable zone, to be thinking is this appropriate? How do I read the room? How do I read the community? How do I best interact and be supportive? I think that that actually, just your comment about that first International Women's Day event, made me think about how important it is for allies to be ready to receive and attract and engage but also sometimes there's a tension for allies who are, I think we can call them hesitant allies, because maybe there's a sense of guilt, or embarrassment, or other discomfort in engaging and getting involved. That's actually not one that I know how to solve because it's hard to say for an affinity group as a whole, that they all should be accepting of all allies, or that all allies will have success meeting, and in fact engaging, with any individual from an affinity group. I'm curious what your thoughts are on striking that balance between allies wanting to be there and be involved, and at the same time, ready to make themselves vulnerable to rejection, I guess, from a couple of members that may be are the first ones they meet from an affinity. What do you think? Roberto: Yeah. I don't have the answer either. I certainly read a lot on diversity and inclusion. I try very hard to be a supporter of diversity and inclusion but I certainly, I'm not perfect at inclusion, that's for sure. I definitely miss the mark sometimes. In particular, I know I read a bunch of articles, Harvard Business Review, talking about the need for sponsorship for people to succeed in organizations, and in particular, for males to sponsor women as well. It's not sort of a divided line by gender. But when I do that I sort of have a very direct approach. I don't always have the highest emotional intelligence in terms of reading what the impact of my questions or statements may be. Maybe I get a bit man slatey and it's not intentional. It's for the purpose of trying to sponsor and support women but, you know, it's not always effective or appropriate. So, that's more identifying the issue as opposed to the solution but the approach I've sort of taken is diversity and inclusion, I'm going to screw up. I'm going to try a bunch of things. I'm going to try not to screw up. I'm not going to try and make mistakes but I'm willing to take the leap and try really hard and try and learn more and try to have an open conversation and I think as you learn more you learn to ask more questions. You learn to sort of step back more and so I think you get better at the conversation and identifying the conversation with practice. I think there's always going to be a level of, you are sort of putting yourself out there. There is a level of risk. You may offend people and so there is just an innate risk, I think, in that. I don't know. What do you think? Cindy: I think that's a really good point and a really good point about calling out that the reality is we're going to screw it up. I can think of all the times, as I'm learning vocabulary or learning about the specific individual that I'm talking to and how he or she likes to interact and all the times I've put my foot in my mouth. But I do think that your advice is fantastic. We just have to keep trying and with feedback and not be embarrassed. Roll that feedback into the next conversation and try to limit the embarrassment because overall, I think the goal is an improved inclusive community. We've got to be ready to get some egg on our face. Roberto: The more that we're having the conversation, I think, the less likely we are to make mistakes. We'll make less mistakes, and so, if you're not even talking about it then maybe you're making mistakes and just not even knowledge about it or it's not even prioritized. We do occasionally take a step back whereas we try to step forward but if the intentions there and especially when you get to know people. A lot of people are really happy to engage in these discussions. It's not everybody who's coming from a marginalized groups responsibility to explain everything and their experiences. I appreciate that but, again, it's that fine line of how do we support this cause? How do we sponsor people? How do we make sure people in our organization who are amazing are succeeding? Cindy: Yeah. I think that's absolutely right. Just thinking back to your earlier question about how do we be allies. We've talked a lot about the role that we play in the office and kind of on an informal level but picture our lawyers, a judge wants to pause for a moment and reflect on how in society some of the laws and regulations that are in place are also lobbying for those laws to be in place, is a significant area of being allies as well. You know there's not a lot of change in the news recently and it makes me think of a conversation that I had with a colleague back when I was starting to practice, and I was practicing constitutional law, back at that time we were talking about minority wranglers right in an education setting. It was a situation where if you were to put it to a vote the majority would vote to keep funding or the majority of people who would benefit, which would be the majority. Because that is the nature of how the numbers worked out. I had this really interesting conversation with a colleague that … this is why these protections and laws are so important because otherwise the minorities that we, as a society, have chosen to protect and foster and include, will just never have a fighting chance if we just go back to the numbers and bank on people's goodwill. That really changed the way that I thought about some of our charter rights and some of the importance of our charter rights and I just wanted to take a moment to think about how important it is to lobby for, not just conversations like this, or being nice to your neighbours, or personally taking the time and space to learn and be inclusive, but also how important it is to have the structure as a society. It's not perfect for the minorities that are protected under our constitution but at least there's that line in the sand, that base line, that can lead to more protection so that we have the space to have the conversations that we're having like this in the workplace, as opposed to fighting for basic rights on paper. Roberto: Yeah. Absolutely. These conversations are helpful but they're certainly part of a larger societal piece. Cindy: Yeah. For sure. I wanted to say that I thought it was really helpful that we have these conversations as allies about some of the challenges of being allies and how we think we can work together with each other and maybe at work we can support each other as allies while we are trying to support others in their journeys for more diversity and inclusion within their community and work community. It feels really great. Roberto: Great. Well this has been a really fun conversation. I know we're going to have a lot of opportunities to get into it more with some other guests in the future in Season 4. I'm very excited to work with you on the upcoming season of Diversonomics. Sarah Willis has done a wonderful job and I certainly thank her for all the work she's done the last 3 years but very excited on the new horizon as we head into Season 4 next year. Cindy: Thanks again for having me. I will try my best to fill Sarah's shoes or be at least an acceptable co-host. It was a real pleasure and I look forward to having more of these chats with you. Roberto: Well we're off to a good start for sure. For our listeners, if you ever have any questions, comments or ideas for topics and guests please look us up at gowlingwlg.com and get in touch with us. We'd love to hear from you. Also make sure to check out the show notes for this episode at diversonomics.com. Last, but not least, make sure you subscribe on Apple podcast so you don't ever miss an episode. And while you're at it leave us a review. You can also follow me on Twitter at @robaburto. Cindy, any social media you want to plug? Roberto: Diversonomics was presented to you by Gowling WLG and produced by Rachael Reid and edited by Joshua Bowman. Special thanks to Mark Jocelyn for his assistance in the production of Season 3 and Susan Clark for taking care of the CPD accreditation for Diversonomics. I'm sure many people will be listening to this episode on December 31 at 10:00pm to get their last of their professional accreditment. So congratulations on making it there. We'll see you in Season 4.